Electroencephalography has probably been familiar to everybody under the acronym “EEG” for about 80 years. In the beginning, the measuring technique for this examination method for measuring brainwaves was as large and compact as a desk. It has been continuously further developed. But now it is making a leap into telemedicine. The “Home Monitoring of Brain and Body Functions” (in short, HOME2B+) is being developed jointly by the University Hospital Magdeburg Department of Neurology and the globally operating information and consumer research company Nielsen. 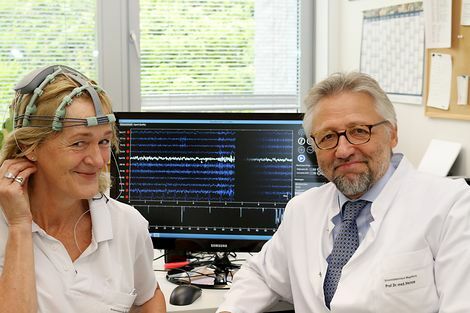 “I have been conducting EEGs for 36 years”, says Anne-Katrin Baum. She is the senior medical technical assistant for functional diagnostics and has worked all these years at University Hospital Magdeburg. Prof. Dr. Hans-Jochen Heinze, Director of the University Hospital Magdeburg Department of Neurology and Neurophysiology, is pleased with the overall abundant wealth of professional experience in his team – not only with respect to analysing electroencephalograms. The knowledge of forerunner devices is also advantageous in the development of a new generation of EEG. Graphic displays of voltage fluctuations on the surface of the head reveal much about activity and possible disorders in the network of brain cells. “In former times, quite a bit of paper on which these waves were recorded came from the devices”, remembers Anne-Katrin Baum, and in contrast she points to the typical wave patterns on her monitor. The computer age obviously saved time and material. What has remained until now is the relatively elaborate placement of about 20 electrodes on the head, which must be placed in a sodium chloride solution beforehand. The scalp is prepared with an electrode paste similar to an exfoliating cream so that contact is established with the electrode gel, and the brainwaves can be conducted and measured. “The development of a cap in which the electrodes are already incorporated so that they do not slip on the head brought relief”, says Ms Baum. She takes such a model out of the package: modern – but not “the latest thing”! Only two hand movements are needed for the very latest electrode cap, and then it fits perfectly. The patient can put the cap on themselves. And the dry electrodes also provide data of high quality without gel and paste. These are the prerequisites for what the scientists and physicians at University Hospital Magdeburg have planned: “Home Monitoring of Brain and Body Functions” (in short, HOME2B+) is the name of the project in the field of telemedicine. A two-year field trial will start in the autumn of this year. “About 50 neurologists in Magdeburg and Halle were able to be won over for this project”, says Prof. Hans-Jochen Heinze. He envisages that the medical colleagues will bring up to 2,000 patients into the trial: “Patients with short-term changes in the states of consciousness: the causes for this are usually cardiac arrhythmias, a stroke or an epileptic seizure. The symptoms are similar, but their therapy varies extremely”, emphasises Heinze, and he adds that the capacities in the hospitals are far from sufficient for keeping the number of risk patients under observation until such a seizure occurs and can be recorded by means of EEG. Home monitoring by means of the new dry electrode cap makes it possible that patients can stay in their home environment and send their EEG data from their own mobile phone or computer to the computer in the medical practice. “The data will be partially automatically evaluated. The use of a cardiac pacemaker or an antiepileptic agent can be decided safely on the basis of this data”, says the neurologist. Among other things, Saxony-Anhalt is taking advantage of the serious demographic changes in the state to assume a pioneering role with regard to developments in the field of medical technology. “An ageing society increasingly in need of therapy costs money”, says Prof. Heinze. That is why the state has joined the HOME2B+ telemedicine project as a cooperation partner. “In 2012 the Ministry of Science and Economic Affairs entered into an agreement with the American company Nielsen. It involves a test regarding whether the cap developed by the company can be utilised for medical purposes”, he says. He himself had become aware of this invention through a colleague from the USA. Among other things the information and consumer research company Nielsen researches how the neurosciences and their techniques can be applied in terms of marketing. It had originally developed the cap in order to test how consumers respond to different forms of advertising. The medical technical assistant Anne-Katrin Baum refers to a close and constructive collaboration with Nielsen product developer Yakob Badower. Together with the chief technician, who works in Berlin, the Magdeburg team developed the cap which is now being tested in the field trial. “However, HOME2B+ can not only be utilised for observation, but also for therapy by means of neurofeedback”, emphasises Baum. In simplified terms, she explains: “For example, a stroke in a certain area of the brain leads to paralysis of an arm, because there is no longer any current due to the short circuit. But the computer can analyse the patient’s brain activity with the aid of the electrode cap. If the patient concentrates strongly on the paralysed arm, an electrical impulse causes the patient to lift their hand. As a reward, so to speak, the brain gets back a positive signal. So the disturbed nerve interaction between the arm and brain can be significantly improved through continuous feedback training with the device at home.” Her boss adds that “attention deficit disorders are also part of the therapeutic area, particularly among children”. In terms of simple handling, this cap has a unique selling point among comparable products up to now. And if it is produced in a correspondingly high quantity it will also be financially competitive, predicts Professor Heinze. Together with the supporters of the HOME2B+ project – with the State of Saxony-Anhalt, Nielsen and the trade guild health insurance funds (IKK) leading the way – he is promoting the establishment of a production company for the dry electrode caps. “Such a company would be very-well settled in the Magdeburg Neurological Medicine Centre”, emphasises the physician. Caption: Prof. Dr. Hans-Jochen Heinze, Director of the University Hospital Magdeburg Department of Neurology and Neurophysiology, and Anne-Katrin Baum, senior medical technical assistant for functional diagnostics, are also going on a lecture tour with the dry electrode cap.